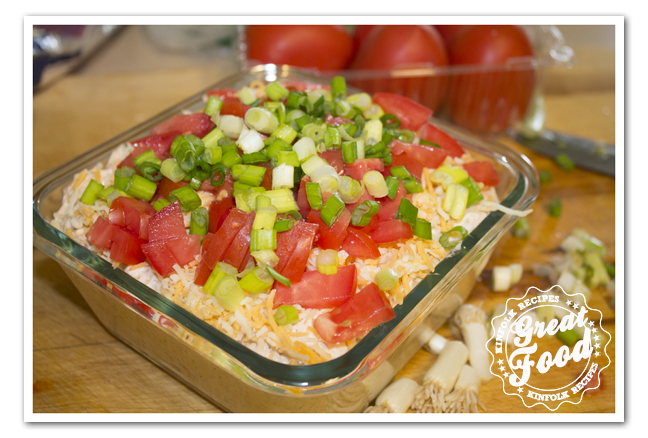 Pimento Cheese (aka Southern Pâté) is simple and easy. 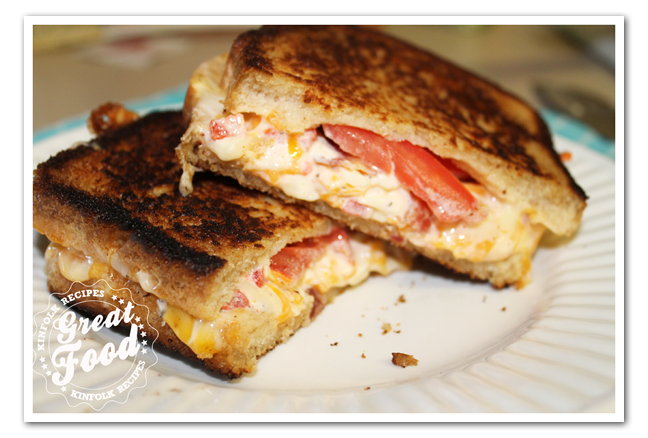 Never heard of pimento cheese till we moved to the south. 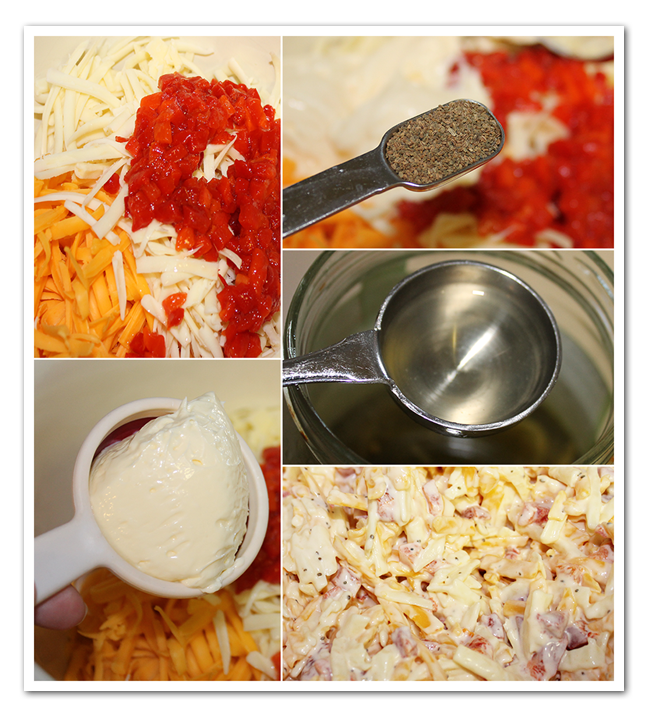 Sure you can buy the pimento cheese in a plastic tub but why not make it yourself. Trust me you will like it. Mix first 6 ingredients in medium bowl. Blend well. Season with salt and pepper. Cover; chill until cold, at least 2 hours. 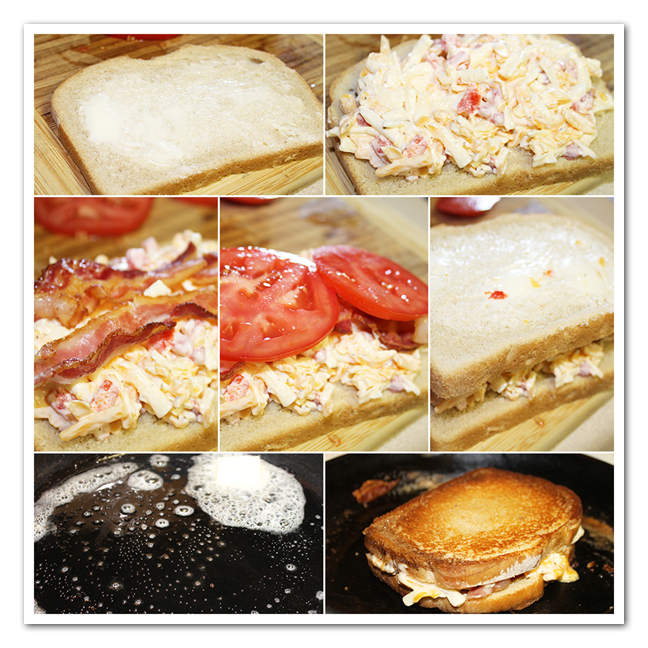 Serve pimiento cheese with crackers, or, if you like spread between 2 slices of white bread add some prepared bacon and tomato. Fry in a skillet on both sided. Mix first 6 ingredients in medium bowl. Blend well. Season with salt and pepper. Cover; chill until cold, at least 2 hours. 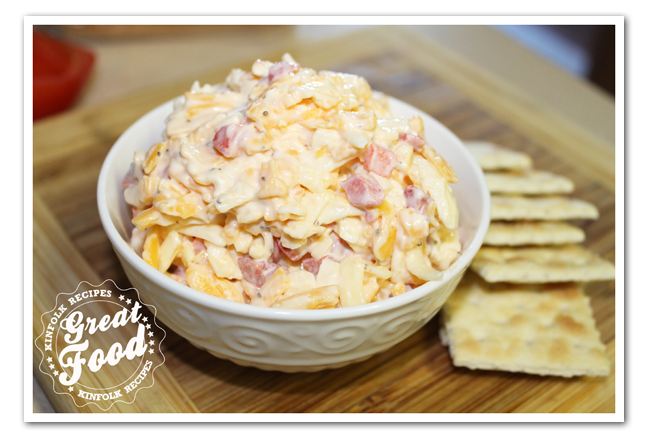 Serve pimiento cheese with crackers, or, if you like spread between 2 slices of white bread add some prepared bacon and tomato. Fry in a skillet on both sided. 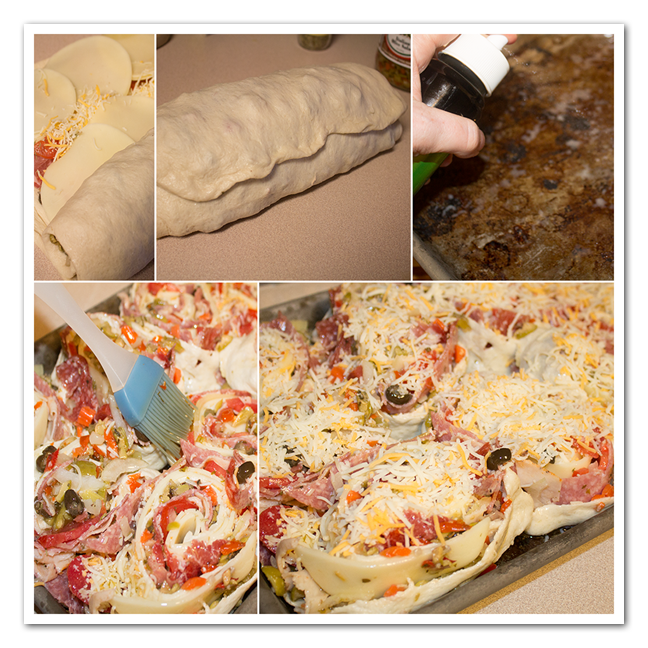 If you like Muffuletta’s then you will love these Muffuletta Pizza Rolls. If you don’t care for olive spread don’t bother this recipe. Preheat oven to 375 degrees. If you like the olive spread with small pieces, give it a swirl in you kitchen aid machine. I don’t mind mine chunky so I left it just like that straight out of the jar. Roll dough out and slightly stretch it with your hands. 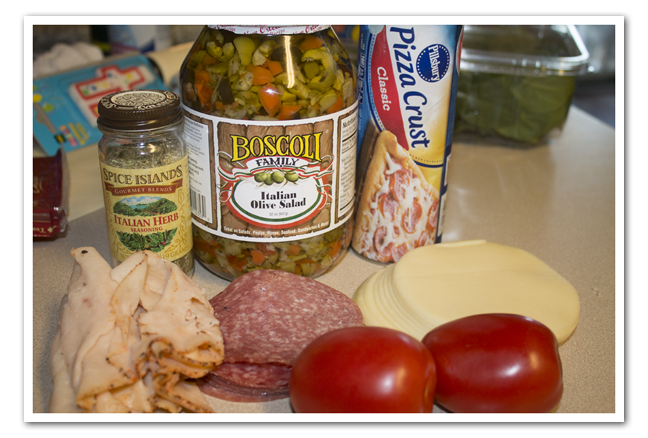 Place olive spread on top of dough, top with the meat, sliced tomato and sliced onion. Sprinkle the Italian seasoning on the tomatoes. Now top with the Provolone cheese and the grated cheese. Roll dough up and cut into about 2 inch rolls. You should get 9 rolls if you like it thicker slice in 2 inch rolls. Place the rolls on a greased cookie sheet, baste the rolls with olive oil (from the jar of the olive spread). 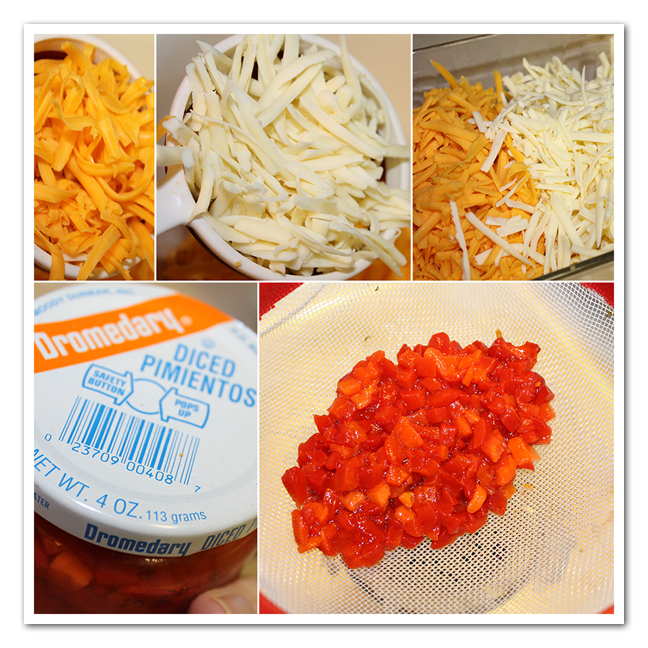 Top off with the rest of the grated cheese. Bake at 375 degrees for about 30-35 minutes until golden brown and dough is cooked. 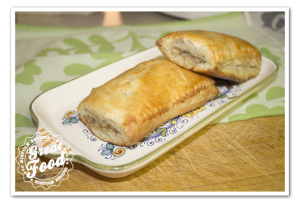 Dutch Sausage Rolls (Saucijzenbroodjes). 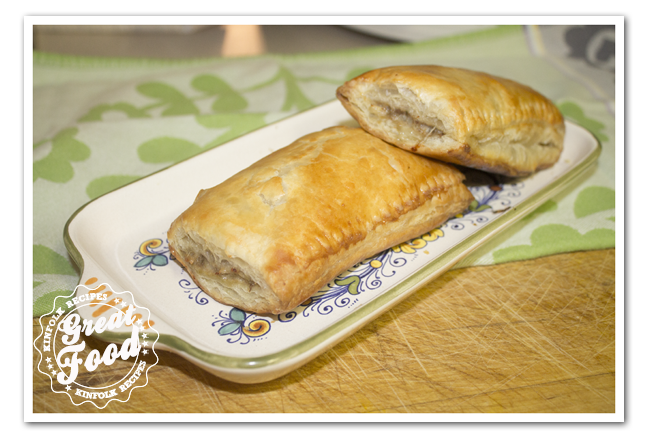 Spiced meat rolled in puff pastry, a delicious appetizer or snack. If you don’t feel like mixing up the meat you could change it up with Italian Sausage then you have saucijzenbroodjes with an Italian twist. Preheat the oven to 400F and take the puff pastry out of the freezer so it can thaw out. Soak one slice of bread in the milk, squeeze the milk out of the bread and then add to the ground beef and ground pork. 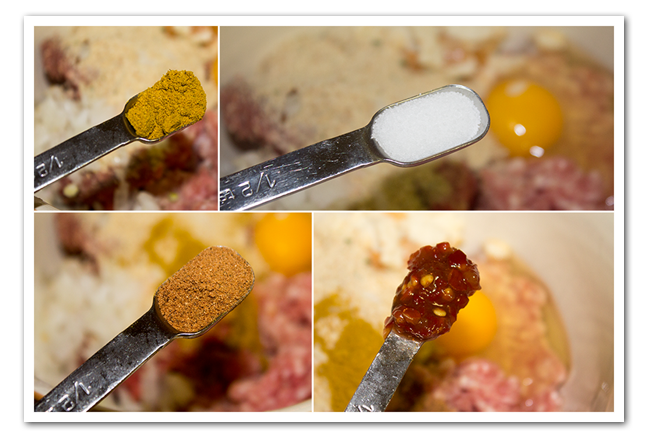 Add one egg and the bread crumbs to the meat fixture. Add the salt, curry, nutmeg, chili paste and parsley. Mix well. Get a baking sheets and put a silpat on it, that way you don’t have to spray your baking sheet. If you don’t have a silpat use nonstick spray. 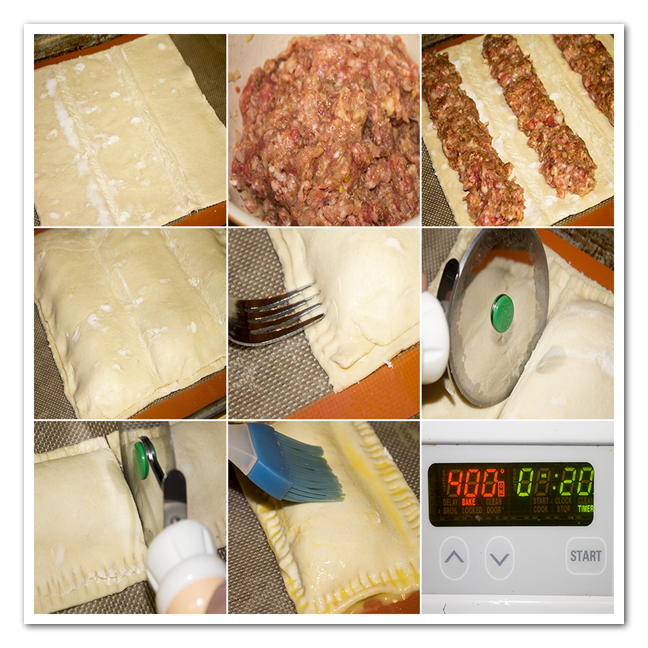 Unfold the pastry puff sheets, put the ground meat mixture in the middle and top off with the other puff pastry sheet. With a fork press the edges. With the pizza cutter cut 3 rows and then half it again, you should have 6 saucijzenbroodjes. Beat egg yolk with water and brush egg mixture over the rolls. Put in the oven and bake for 20 min. 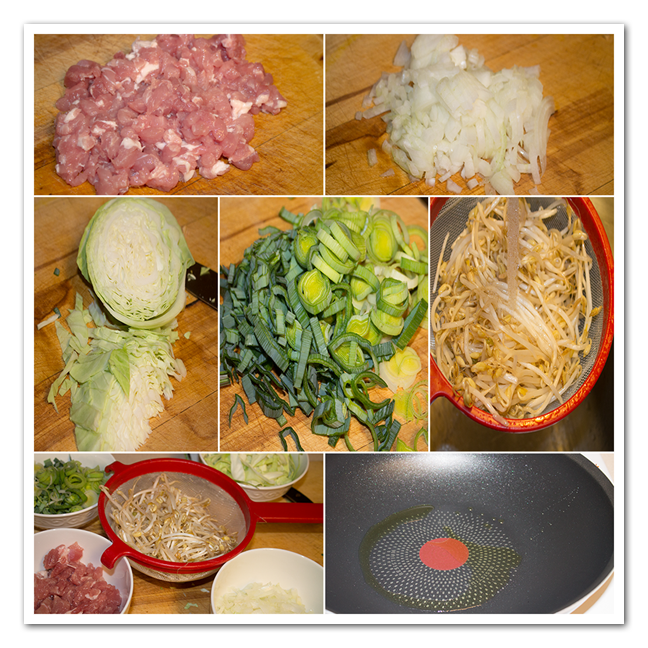 Use the remaining beef pork mixture for meatballs. Preheat the oven to 400F and take the puff pastry out of the freezer so it can thaw out. Soak one slice of bread in the milk, squeeze the milk out of the bread and then add to the ground beef and ground pork. Add one egg and the bread crumbs to the meat fixture. Get a baking sheets and put a silpat on it, that way you don't have to spray your baking sheet. If you don't have a silpat use nonstick spray. 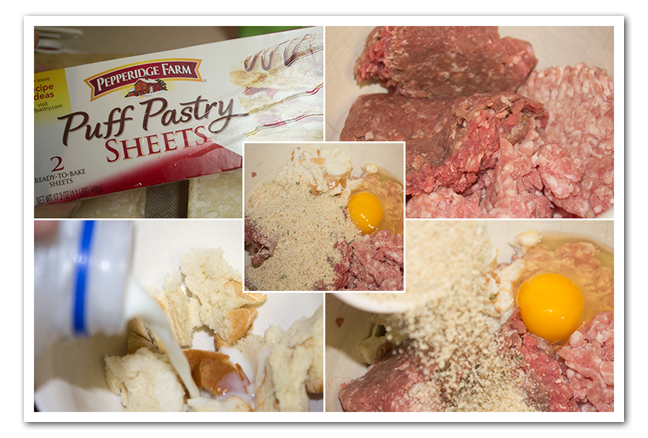 Unfold the pastry puff sheets, put the ground meat mixture in the middle and top off with the other puff pastry sheet. With a fork press the edges. 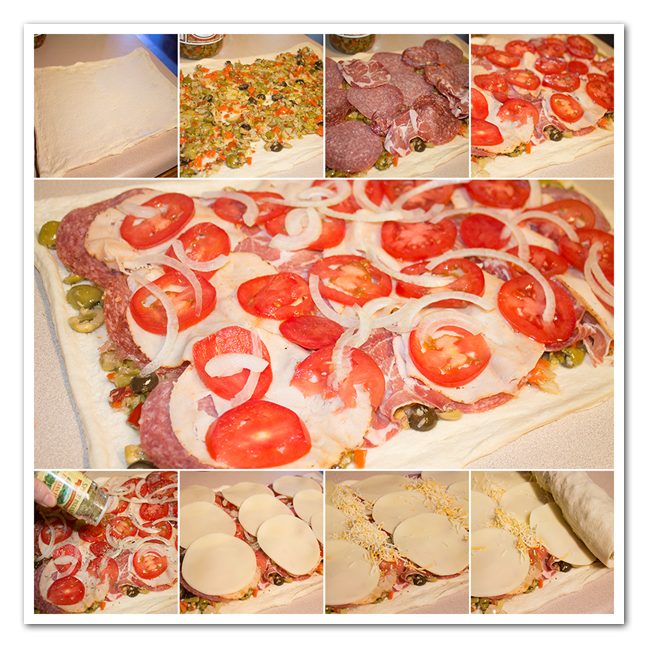 With the pizza cutter cut 3 rows and then half it again, you should have 6 saucijzenbroodjes. Beat egg yolk with water and brush egg mixture over the rolls. Put in the oven and bake for 20 min. 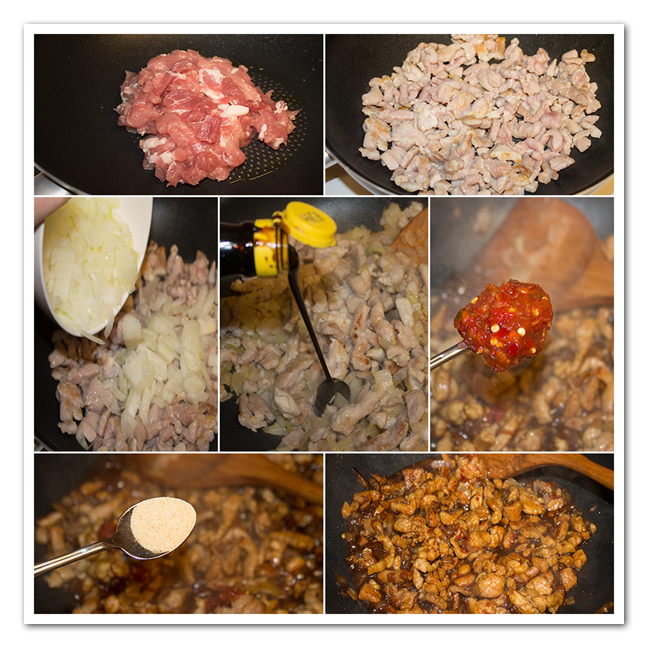 Use the remaining beef pork mixture for meatballs. 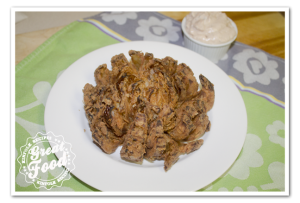 This is a great Outback Steakhouse Blooming onion. Who would have thought a fried onion would taste that good. Combine all the ingredients for the dipping sauce and set aside. 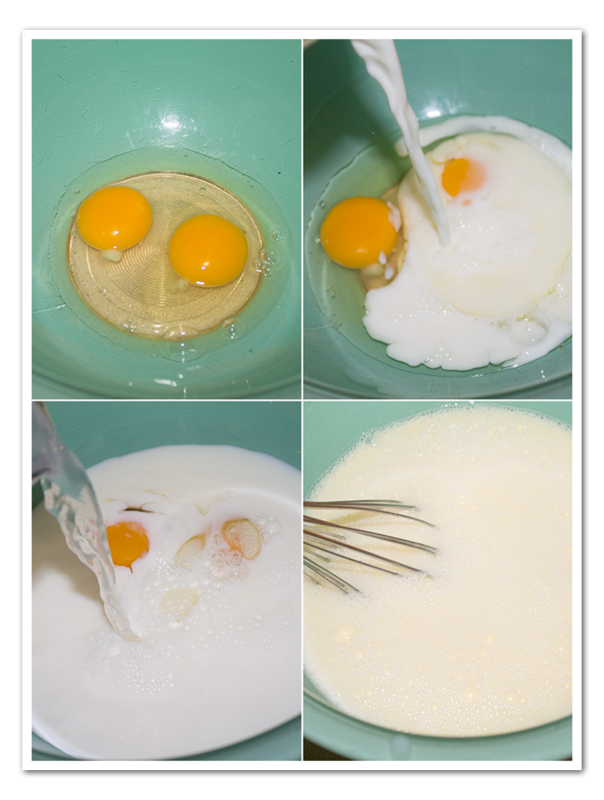 Beat the egg and combine it with the milk in a medium bowl big enough to hold the onion. 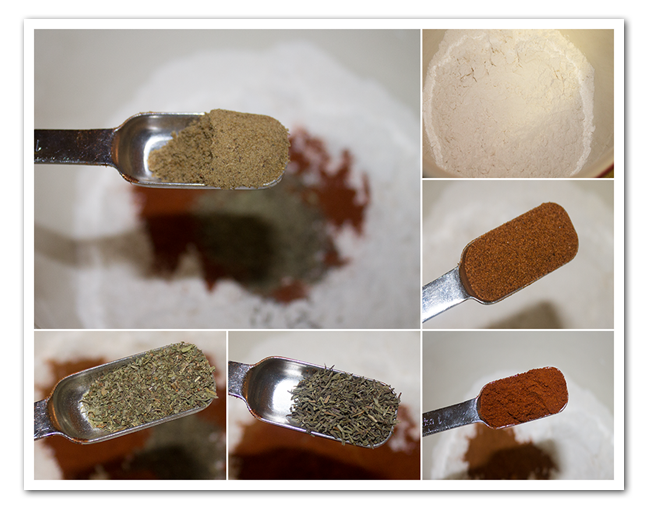 In another bowl, combine the flour, salt, peppers, oregano, thyme, and cumin. Cut the end of the onion on one side. Keep it on on the other side that will keep the onion “whole”. Remove the papery skin. Slice the onion till you got 16 sections. Don’t cut all the way down like I did, pull the petals back some. Submerge the onion in the milk mixture, and then coat it with the dry ingredients. Again separate the “petals” and sprinkle the dry coating between them. Once you’re sure the onion is well-coated, dip it back into the wet mixture and into the dry coating again. This double dipping makes sure you have a well- coated onion because some of the coating tends to wash off when you fry. Let the onion rest in the refrigerator for at least 15 minutes while you get the oil ready. Heat oil in a deep fryer or deep pot to 350 degrees. Make sure you use enough oil to completely cover the onion when it fries. Fry the onion right side up in the oil for 10 minutes or until it turns brown. 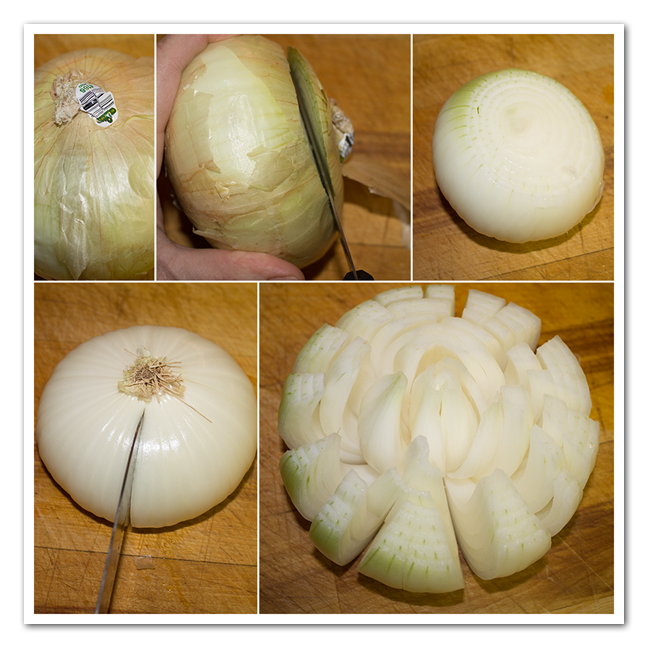 When the onion has browned, remove it from the oil and let it drain on a rack or paper towels. Open the onion wider from the center so that you can put a small dish of the dipping sauce in the center. This is a great Outback Steakhouse Blooming onion made by Todd Wilbur. Made a few modifications. Who would have thought a fried onion would taste that good. Cut the end of the onion on one side. Keep it on on the other side that will keep the onion "whole". Remove the papery skin. Slice the onion till you got 16 sections. Don't cut all the way down and pull the petals back some. 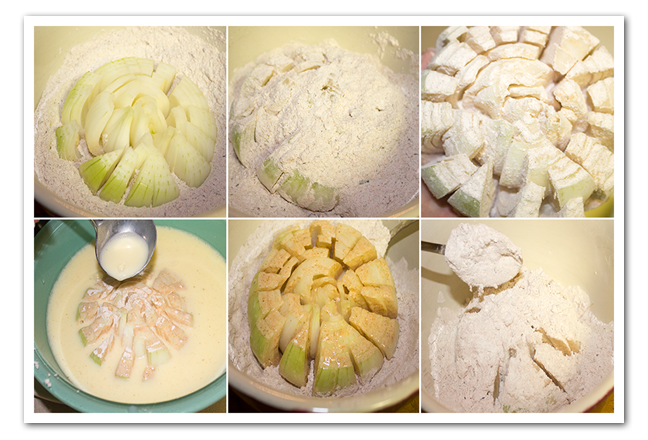 Submerge the onion in the milk mixture, and then coat it with the dry ingredients. Again separate the "petals" and sprinkle the dry coating between them. 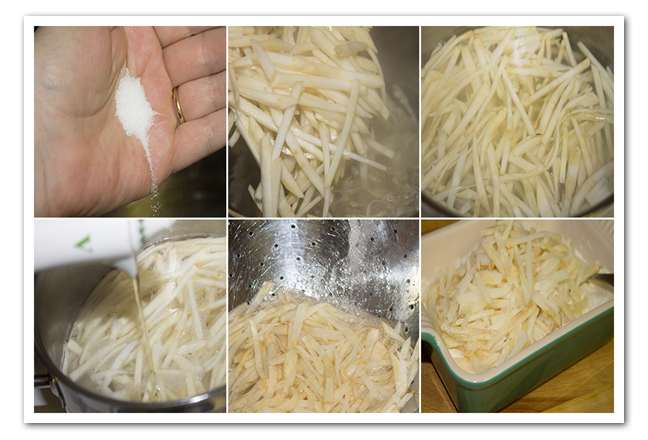 Once you're sure the onion is well-coated, dip it back into the wet mixture and into the dry coating again. This double dipping makes sure you have a well- coated onion because some of the coating tends to wash off when you fry. Let the onion rest in the refrigerator for at least 15 minutes while you get the oil ready. When the onion has browned, remove it from the oil and let it drain on a rack or paper towels. Open the onion wider from the center so that you can put a small dish of the dipping sauce in the center. I am a big fan of diners drive in and dives. 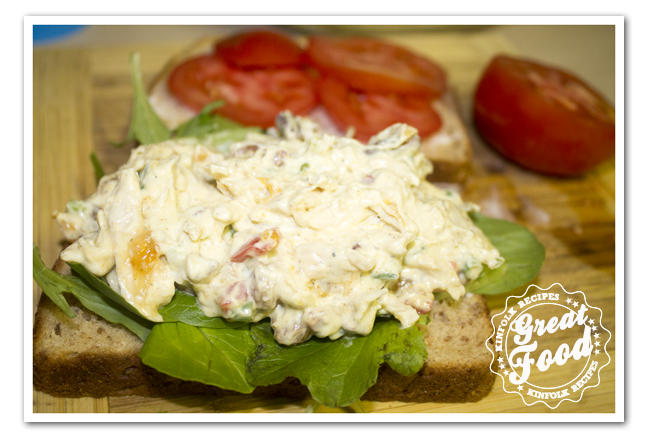 And saw this recipe and I just had to re create this Curried chicken Salad with Peach Chutney. I didn’t have all the ingredients what I saw on the show but replaced them with what I thought was right. I did not use sugar I used honey. I didn’t use almonds I used pecans. When you make it, it will even taste better the next day. Season the chicken breast with salt and pepper. Put in a 350F preheated oven for about 20min. 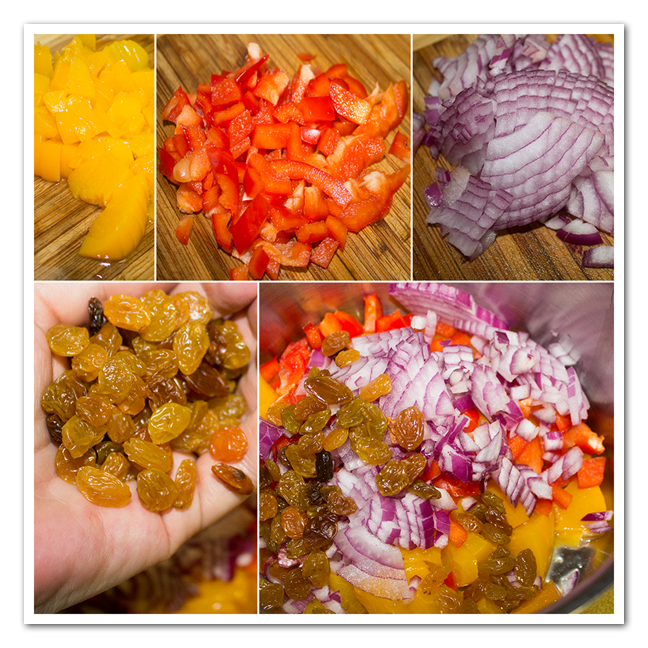 Combine all the ingredients for the chutney and simmer until the liquid is reduced by 1/3. Taste should be sweet and sour, that takes about an hour. Cool to room temp. Shred the chicken. On the show they took a third of the chicken and pulse in a food processor until finely ground, I left that part out. 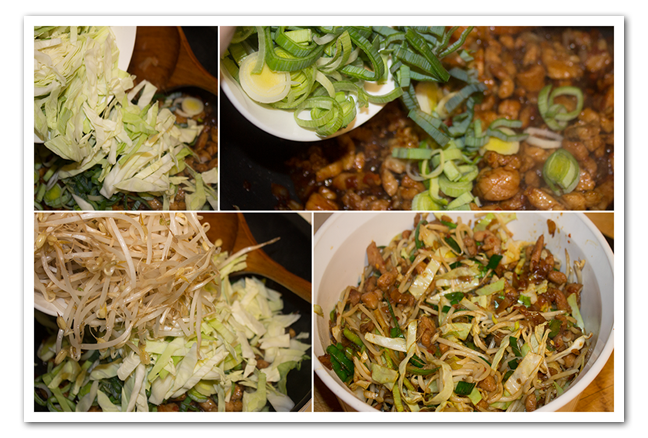 Combine the curry yogurt/mayo, ground chicken, and chicken chunks, with the green onions and chopped pecans. Stir in one cup of the peach chutney. Taste add more chutney as needed. Serve between bread slices with lettuce and tomatoes. I am a big fan of diners drive in and dives. And saw this recipe and I just had to re create this Curried chicken Salad with Peach Chutney. I didn't have all the ingredients what I saw on the show but replaced them with what I thought was right. I did not use sugar I used honey. I didn't use almonds I used pecans. When you make it, it will even taste better the next day. 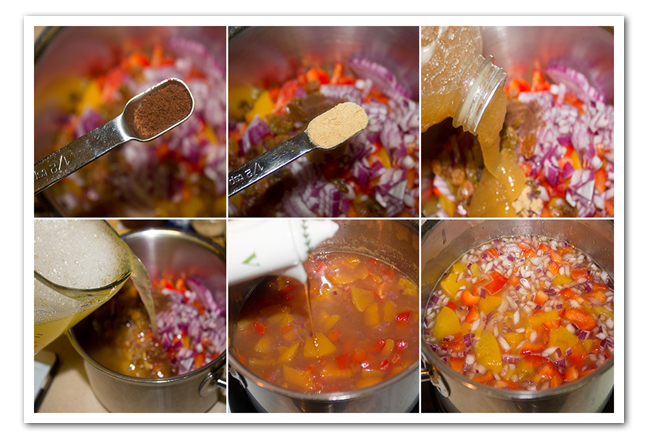 Combine all the ingredients for the chutney and simmer until the liquid is reduced by ⅔. Taste should be sweet and sour. Cool to room temp. That takes about 1 hour. Shred the chicken. 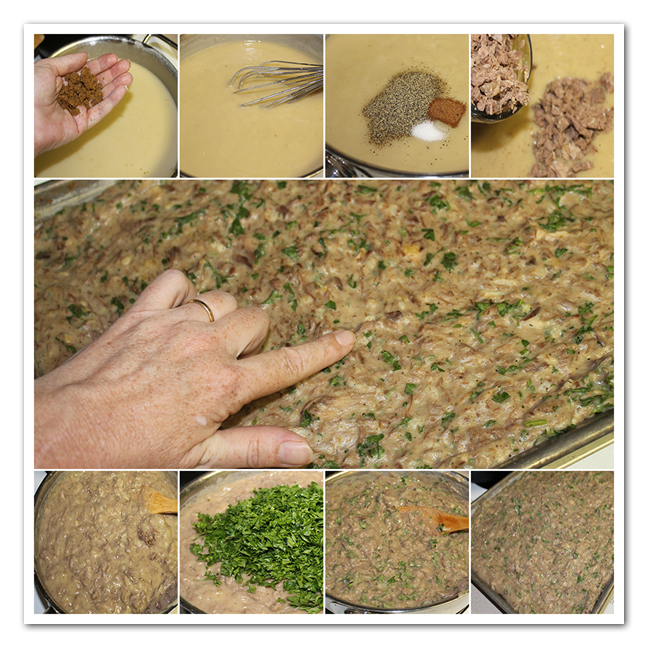 On the show they took a third of the chicken and pulse in a food processor until finely ground, I left that part out. 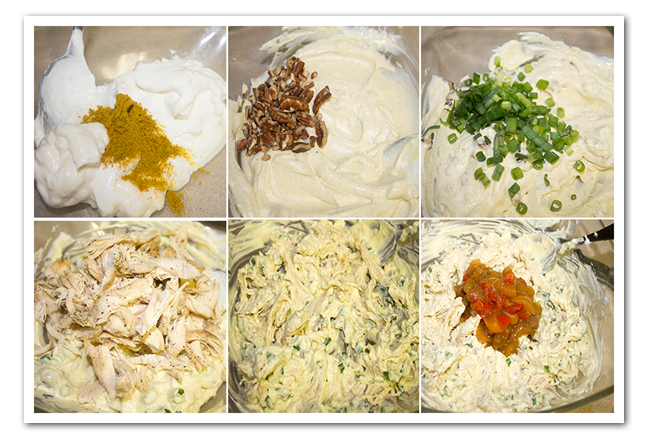 Combine the curry yogurt/mayo, ground chicken, and chicken chunks, with the green onions and chopped pecans. Stir in one cup of the peach chutney. Taste add more chutney as needed. Serve between bread slices with lettuce and tomatoes. This salad is also called celery remoulade , but this is misleading because there is no remoulade sauce used. I used crème fraiche, mayonnaise and mustard. 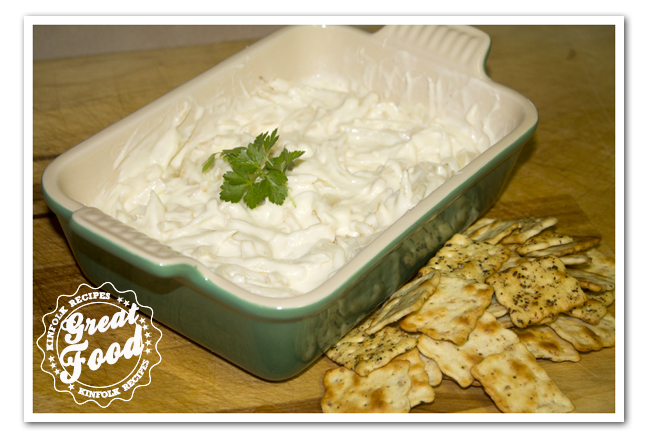 The salad is delicious on crackers or bread and perfect as a side dish with fish. Put water in the pot, boil and add the salt. Then add the drained celery root, and the vinegar, cook for 7-10 min. depends on how thick you have cut the “matchsticks”. They should be “limp” Drain in a colander and rinse with cold water. While the celery root is cooking make the dressing. 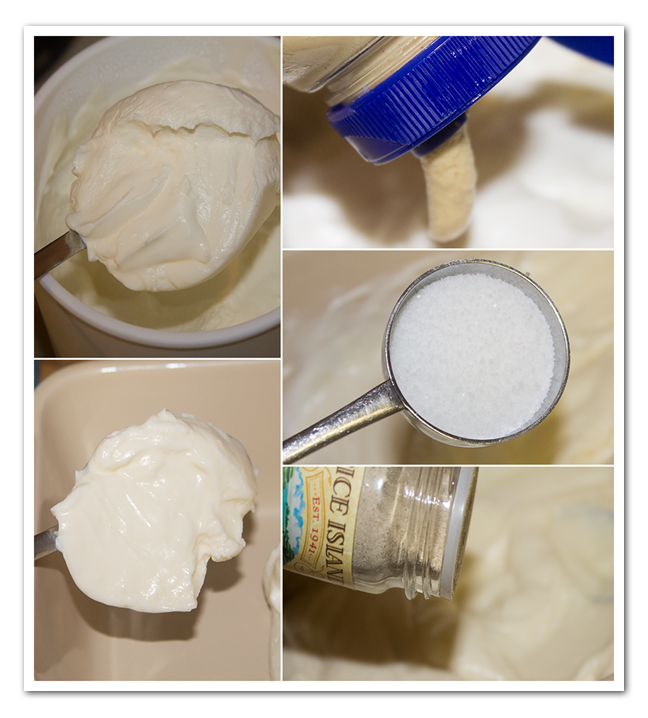 Combine the crème fraîche, mayonnaise, mustard, sugar and white pepper. 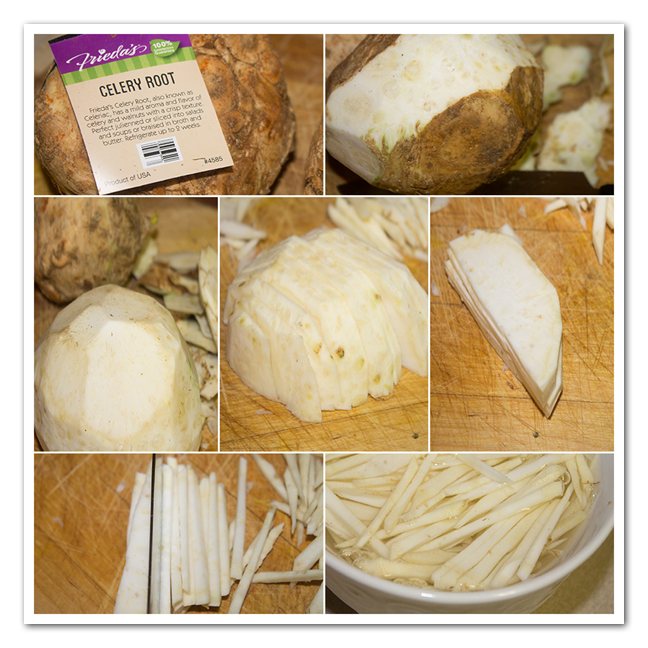 Add the cooked celery root, mix well. Put water in the pot, boil and add the salt. Then add the drained celery root, and the vinegar, cook for 7-10 min. depends on how thick you have cut the "matchsticks". They should be "limp" Drain in a colander and rinse with cold water. This is an oven-baked version of the classic fried finger food buffalo wings. No grease smell in your house and I am sure way more healthier then the fried version. 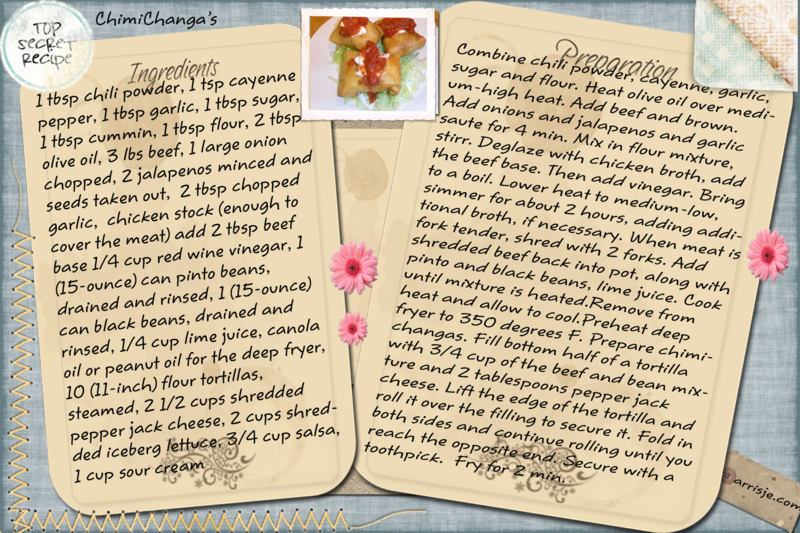 Found this recipe on Yahoo news and didn’t change a bit of it except the hot sauce mixture. If you have bought the whole wings then you need to cut them up in pieces and discard the tips. Place 1 cup hot sauce and 1 cup of buttermilk and the garlic powder in a large resealable plastic bag,stir to combine. Add the wings; seal the bag, pressing out any excess air; and turn the bag to coat the wings evenly. Marinate in the refrigerator, turning occasionally, for at least 2 hours or overnight. Heat the broiler to high and arrange a rack in the middle of the oven. Cover a baking sheet with aluminum foil and place a wire rack on it. Remove the wings from the marinade, letting any excess drip off, and arrange in a single layer on the rack. Discard the marinade and broil the wings until the meat starts to pull away from the bones and the skin is deep golden brown, bubbling, and crisped, 12-15 minutes. Remove from the oven and turn the wings over using tongs. Return wings to the oven and continue broiling until the skin is deep golden brown, bubbling, and crisped on the second side, about 12-15 minutes more. 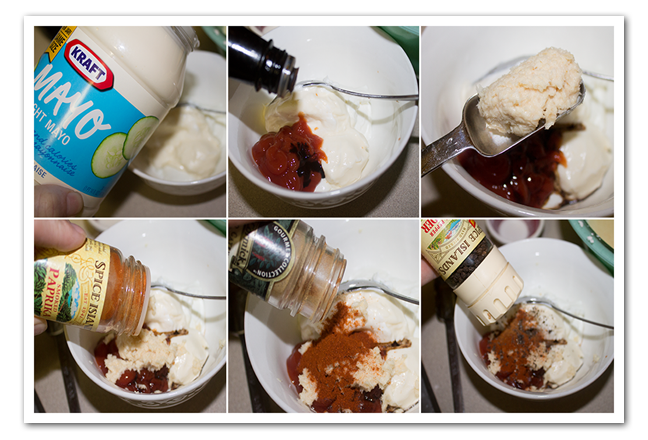 Meanwhile, combine remaining ½ cup hot sauce and melted butter, honey and vinegar in a pot and cook till bubbly. Add cooked wings and toss to coat. Serve immediately with ranch dressing, celery sticks and carrots. 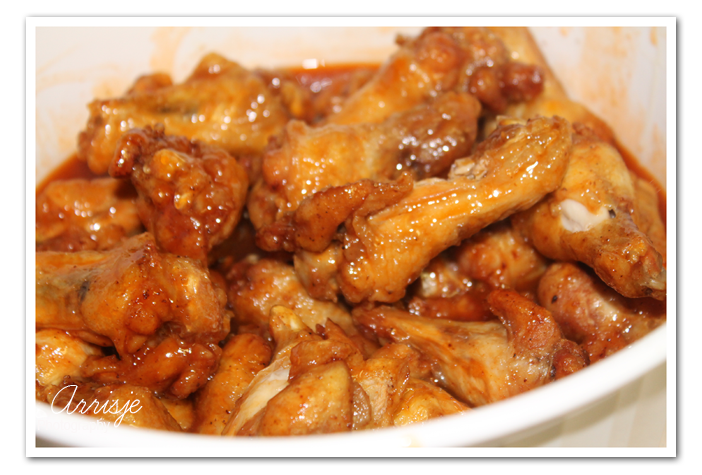 This is an oven-baked version of the classic fried finger food buffalo wings. No grease smell in your house and I am sure way more healthier then the fried version. If you have bought the whole wings then you need to cut them up in pieces and discard the tips. Place 1 cup hot sauce and 1 cup of buttermilk and the garlic powder in a large resealable plastic bag,stir to combine. Add the wings; seal the bag, pressing out any excess air; and turn the bag to coat the wings evenly. Marinate in the refrigerator, turning occasionally, for at least 2 hours or overnight. 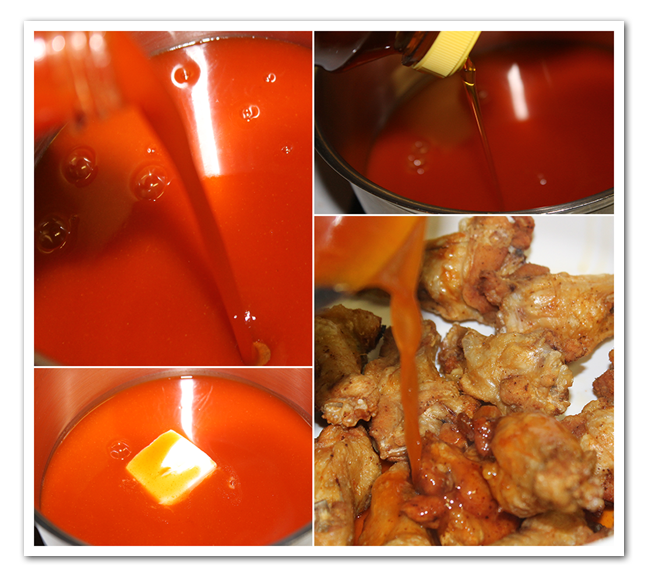 Meanwhile, combine remaining ½ cup hot sauce and melted butter, vinegar and ½ cup of honey in a pot and cook till bubbly. Add cooked wings and toss to coat. 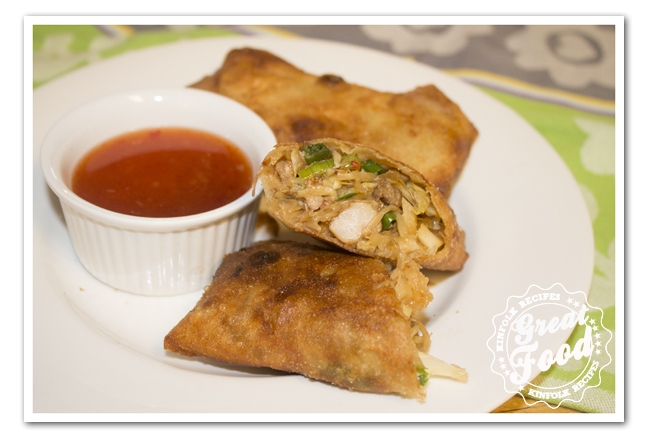 Serve with ranch dressing, celery sticks and carrots. The kroket or bitterbal is a a deep fried snack, popular in the Netherlands. It is crunchy on the outside, but very soft and smooth on the inside. The difference between a kroket and a bitterbal is the size. Kroket is a small roll and a bitterbal is a small ball.Each year 300 million croquettes are sold in the Netherlands (which works out to about 18 per person annualy), making it the second most-popular snack in the country. This number does not include croquettes made and consumed domestically, likely to number in the millions as well. Its popularity is only surpassed by the frikadel, a minced-meat hot dog, of which about 580 million are sold each year.Vendors have often tried to market and sell it in other countries, but have failed, even in neighbouring countries like Belgium and Germany. Potato croquettes, however, are quite popular in some parts of Germany and in Belgium. In Japanese cuisine, a relative of the croquette, known as korokke is a popular fried-food item, but is generally patty-shaped, and served with a brown sauce.HistoryThe croquette was actually a French invention, and was introduced in the Netherlands at the start of the 20th century. In 1909, the Dutch patissier Kwekkeboom came across a fried, ragout filled croquette in France. The French used all sorts of fillings to make their croquettes: various kinds of meat, fish, vegetables, and potatoes. Kwekkeboom introduced the croquette to the Netherlands and started producing croquettes filled with good-quality beef. The croquette became hugely popular, and nowadays there are numerous suppliers, though quality and price can differ greatly. Suppliers have experimented with all sorts of croquette fillings, including salmon, asparagus, sate, shrimp, cheese, and goulash. Croquettes, and frikadels (and other hot snacks like hamburgers) are often sold in snack bars, in particular in automatieken (see also automat). They are often located at railway stations, or in busy shopping streets. One large chain of these automatieks is FEBO. 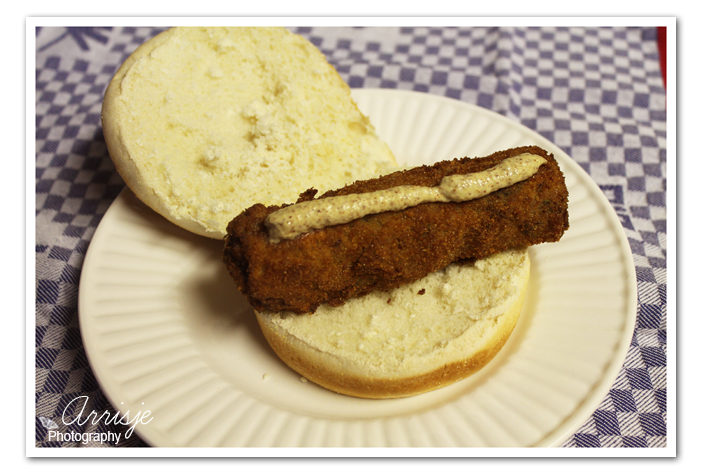 Croquettes are often eaten in a bread bun, with mustard. Croquettes are so popular in the Netherlands that even McDonalds sells something like it, though with a hamburger shape, in a bread bun: the McKroket. 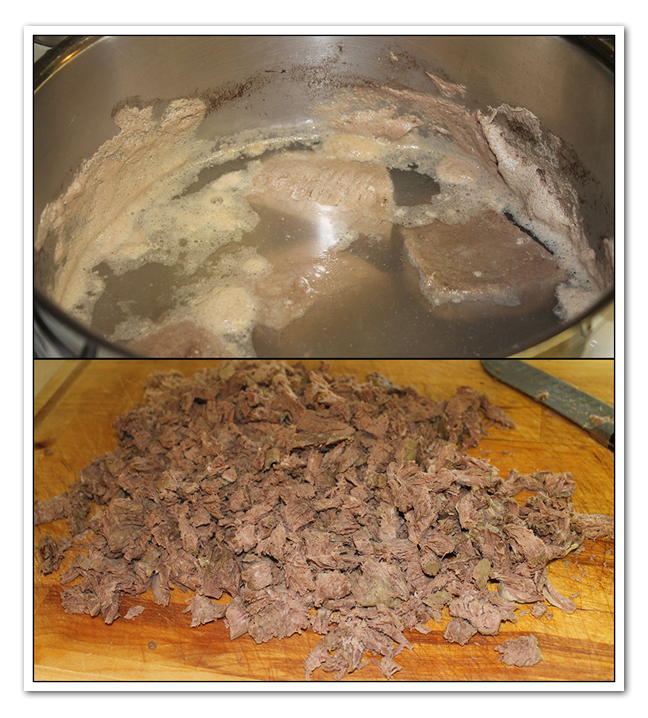 Boil the beef in water till it falls apart or chop it, it took me about a good 4 hour on simmer. Save the beef broth you are going to need it for the roux. You don’t have to use beef you can use pork or chicken, whichever you prefer. It’s time to make the roux and this is how you do it. 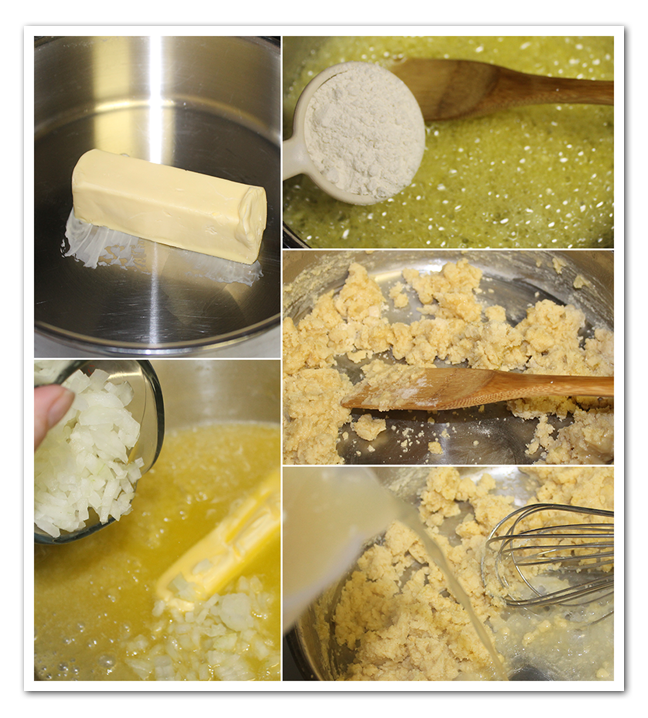 Melt the margarine in the skillet, add the minced onion, cook till translucent, then add the flour. Keep stirring. Then add the beef broth, 1 cup at the time. Keep stirring till you have a nice sauce. Add the seasonings, the shredded or chopped beef and the parsley. 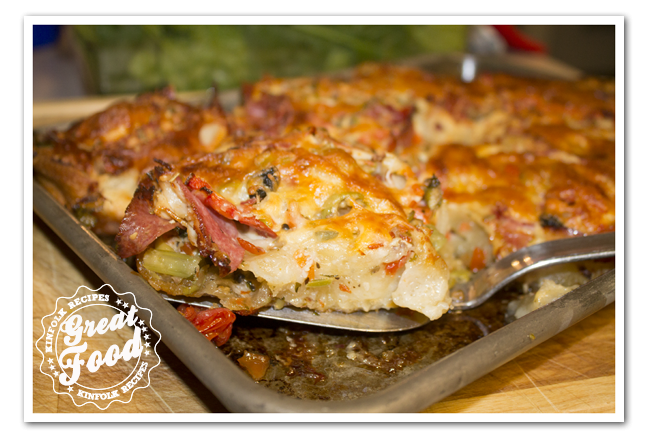 Pour onto a cookie sheet and let it cool in your refrigerator for about 2 hours. When you take it out of the refrigerator it will be a bit more solid. Wet your hand with the canola oil, and roll the kroketten. 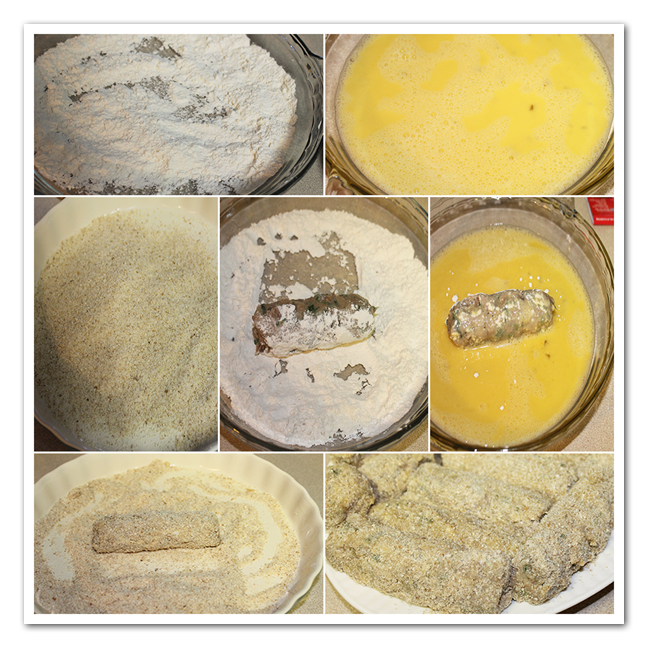 When you are finished rolling the kroketten you roll them in the flour then the egg wash and the last one in the bread crumbs. I like to flash freeze mine but you don’t have to. While I clean up my kitchen I put them in the freezer to flash freeze. The kroket or bitterbal is a a deep fried snack, popular in the Netherlands. It is crunchy on the outside, but very soft and smooth on the inside. The difference between a kroket and a bitterbal is the size. Kroket is a small roll and a bitterbal is a small ball.Each year 300 million croquettes are sold in the Netherlands (which works out to about 18 per person annualy), making it the second most-popular snack in the country. This number does not include croquettes made and consumed domestically, likely to number in the millions as well. Its popularity is only surpassed by the frikadel, a minced-meat hot dog, of which about 580 million are sold each year.Vendors have often tried to market and sell it in other countries, but have failed, even in neighbouring countries like Belgium and Germany. Potato croquettes, however, are quite popular in some parts of Germany and in Belgium. 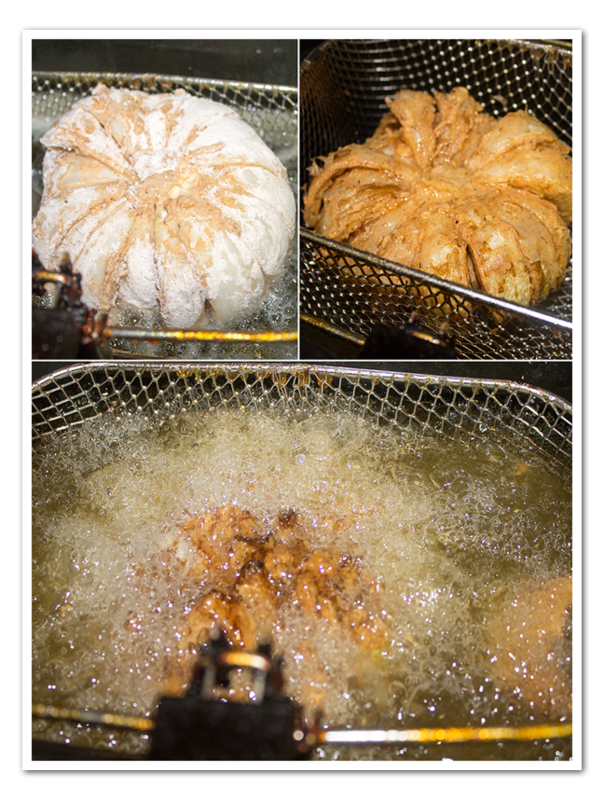 In Japanese cuisine, a relative of the croquette, known as korokke is a popular fried-food item, but is generally patty-shaped, and served with a brown sauce. Boil the beef in water till it falls apart or chop it, it took me about a good 4 hour on simmer. Save the beef broth you are going to need it for the roux. You don't have to use beef you can use pork or chicken, whichever you prefer. It's time to make the roux and this is how you do it. Melt the margarine in the skillet, add the minced onion, cook till translucent, then add the flour. Keep stirring. Then add the beef broth, 1 cup at the time. Ones you finish rolling the kroketten you roll them in the flour then the egg wash and the last one in the bread crumbs. I like to flash freeze mine but you don't have to. While I clean up my kitchen I put them in the freezer to flash freeze. When your kitchen is all cleaned up again you can go and deep fry these kroketten. Eat as an appetizer or eat them for lunch on a bun or a slice of bread. 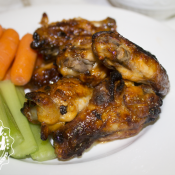 In the Southern United States, wings are often called hot wings, and have local variations in how they are cooked.Buffalo wings or Hot Wings were first prepared at the Anchor Bar on Main Street, near the corner of North Street, Buffalo, on October 3, 1964. Teressa Bellissimo, co-owner of the Anchor Bar with her husband Frank, had the idea of deep frying chicken wings and tossing them in Frank’s RedHot sauce for her son Dominic and his friends. One evening, on a spur of the moment, Teressa presented her son with a deep-fried and sauced creation, and they were an instant hit. 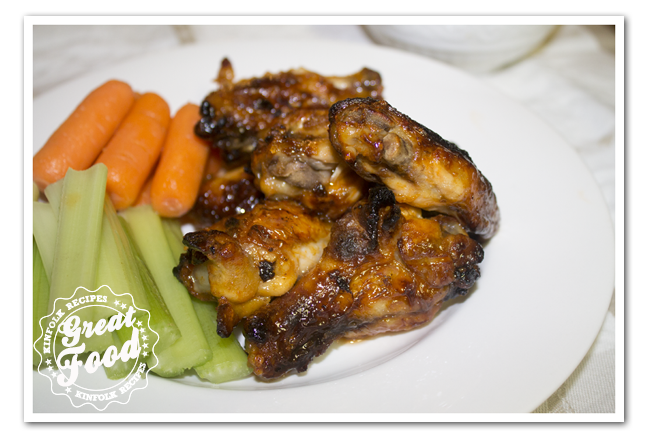 At the time the recipe was created, chicken wings were typically thrown away or reserved for making stock. And now the wings are one of the most requested snack. 1. Wash, dry and season your wings and deep fry them (400F) 10 to 15 minutes or until golden and crisp. They should be ready when they float. Drain on paper towels or in a strainer. While the wings are getting fried, you make the hot wing sauce. 2. Add the hot sauce, honey, butter and vinegar to the pot and warm till butter is melted. Pour over the fried wings. You can eat them with some carrots, celery sticks and some Ranch dressing, or Blue Cheese dressing. In the Southern United States, wings are often called hot wings, and have local variations in how they are cooked.Buffalo wings or Hot Wings were first prepared at the Anchor Bar on Main Street, near the corner of North Street, Buffalo, on October 3, 1964. Teressa Bellissimo, co-owner of the Anchor Bar with her husband Frank, had the idea of deep frying chicken wings and tossing them in Frank's RedHot sauce for her son Dominic and his friends. One evening, on a spur of the moment, Teressa presented her son with a deep-fried and sauced creation, and they were an instant hit. 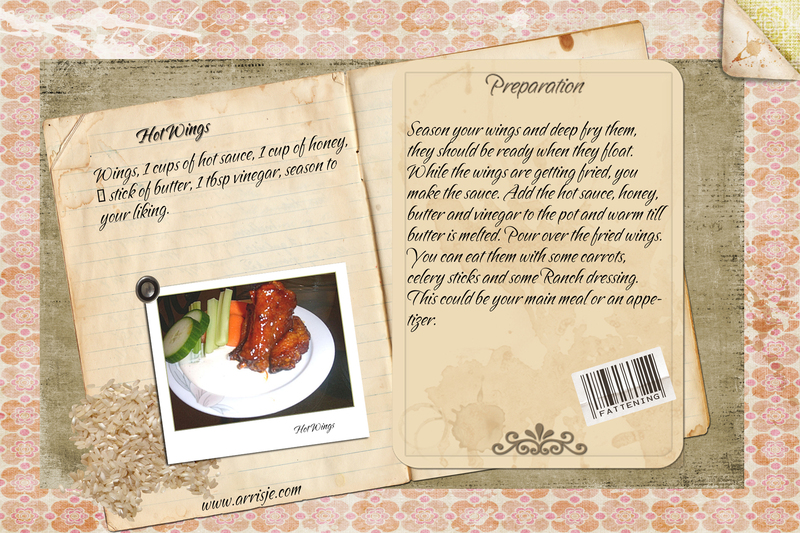 At the time the recipe was created, chicken wings were typically thrown away or reserved for making stock. And now the wings are one of the most requested snack. 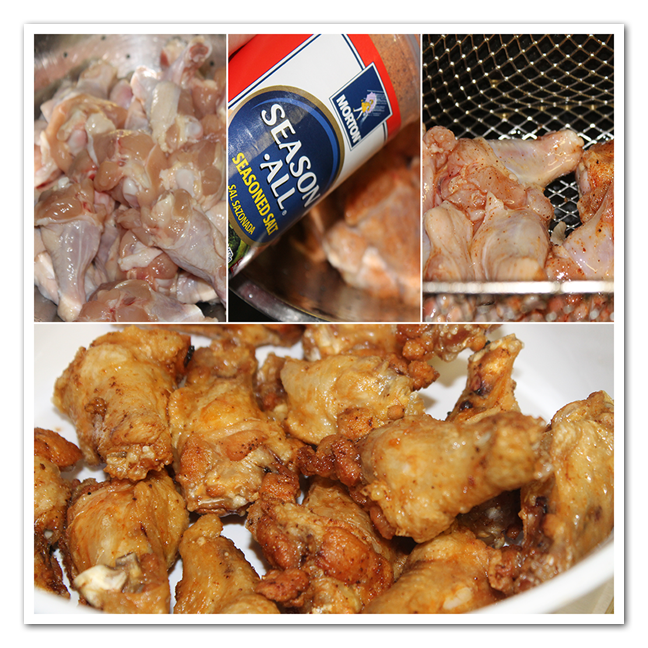 Wash, dry and season your wings and deep fry them (400F) 10 to 15 minutes or until golden and crisp. They should be ready when they float. Drain on paper towels or in a strainer. While the wings are getting fried, you make the hot wing sauce. Add the hot sauce, honey, butter and vinegar to the pot and warm till butter is melted. Pour over the fried wings. You can eat them with some carrots, celery sticks and some Ranch dressing, or Blue Cheese dressing. I was watching Food Channel Network and saw this recipe of Guy Fiery, and thought to myself I got to make this. It’s actually better then I thought. The origin of the chimichanga is subject to some debate. In addition, Macayo’s restaurant in Phoenix, Arizona claims that its founder, Woody Johnson, invented the chimichanga some time in the 1950s. 1. In a small bowl, combine chili powder, cayenne, garlic, sugar and flour. Set aside. In a heavy bottomed, large stock pot, heat olive oil over medium-high heat. Add beef and brown on all sides. Add onions and jalapenos and saute for 4 to 5 minutes. Add garlic and saute for 1 minute more. Mix in flour mixture, stirring frequently, for 2 to 3 minutes. De-glaze with chicken broth, add the beef base. Then add vinegar. Stir well to combine. Bring to a boil. Lower heat to medium-low and simmer for about 2 hours, adding additional broth, if necessary, to keep meat simmering in liquid. 2. When the meat is fork tender, remove to a sheet pan and shred with 2 forks. Add shredded beef back into pot, along with pinto and black beans, lime juice. Cook until mixture is heated through. Remove from heat and allow to cool. 3. 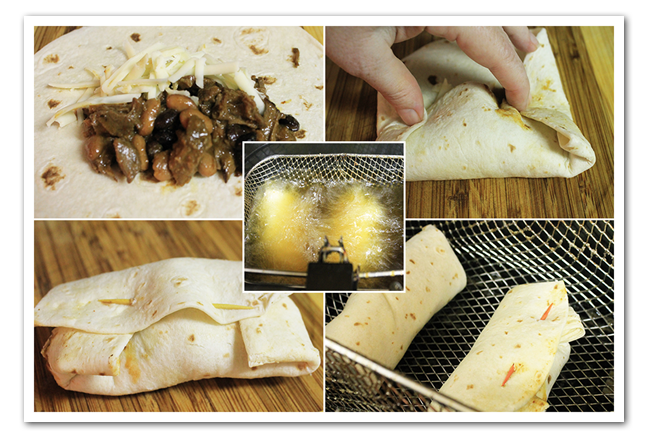 Preheat deep fryer to 350 degrees F. While oil is heating, prepare chimichanga’s. Fill bottom half of a tortilla with 3/4 cup of the beef and bean mixture and 2 tablespoons pepper jack cheese (when filling tortillas, use a slotted spoon to scoop out beef. Lift the edge of the tortilla and roll it over the filling to secure it. Fold in both sides and continue rolling until you reach the opposite end. Secure with a 6-inch skewer weaved through the seam side of burrito. Repeat with remaining tortillas. Slowly lower chimichanga’s into hot oil and cook 2 minutes until golden brown. Remove from oil, drain on paper towels and keep warm in oven until all are cooked. I was watching Food Channel Network and saw this recipe of Guy Fiery, and thought to myself I got to make this. It's actually better then I thought. 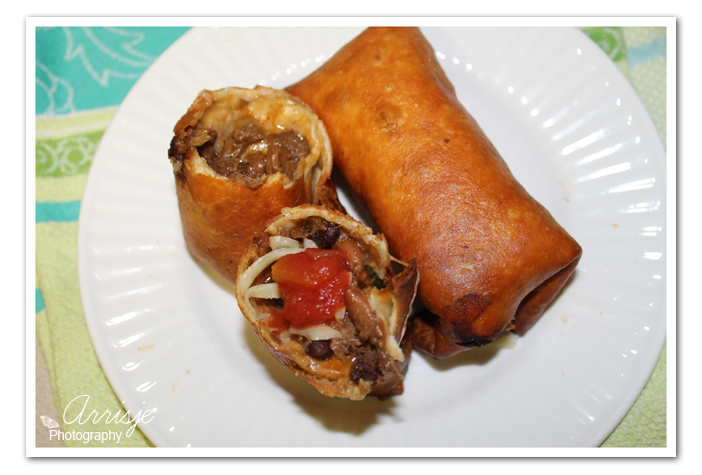 Chimichanga is a meat-filled deep-fried burrito, that originated in Tucson, Arizona. According to a legend, Monica Flin, who started the restaurant El Charro in 1922, accidentally dropped a burrito into the deep fat fryer. She immediately began to utter a Spanish curse-word, but quickly edited herself to say "Chimichanga" the Spanish equivalent of "thingamajig." The origin of the chimichanga is subject to some debate. In addition, Macayo's restaurant in Phoenix, Arizona claims that its founder, Woody Johnson, invented the chimichanga some time in the 1950s. 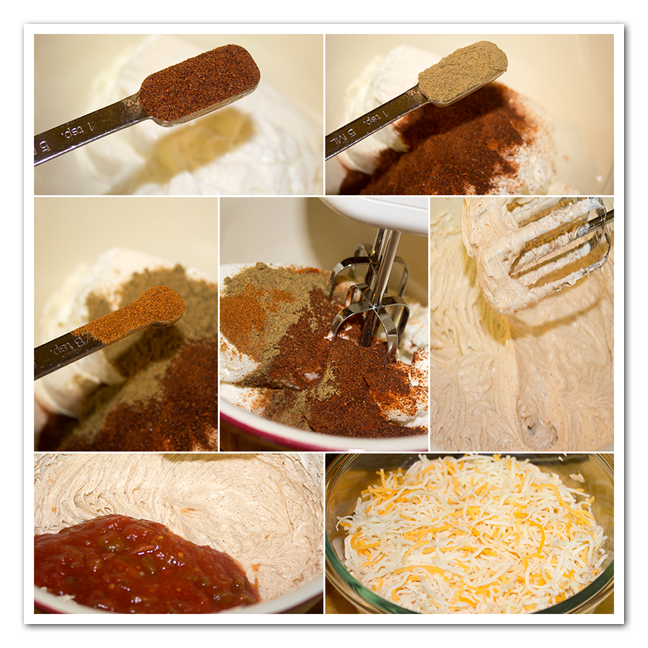 In a small bowl, combine chili powder, cayenne, garlic, sugar and flour. Set aside. In a heavy bottomed, large stock pot, heat olive oil over medium-high heat. 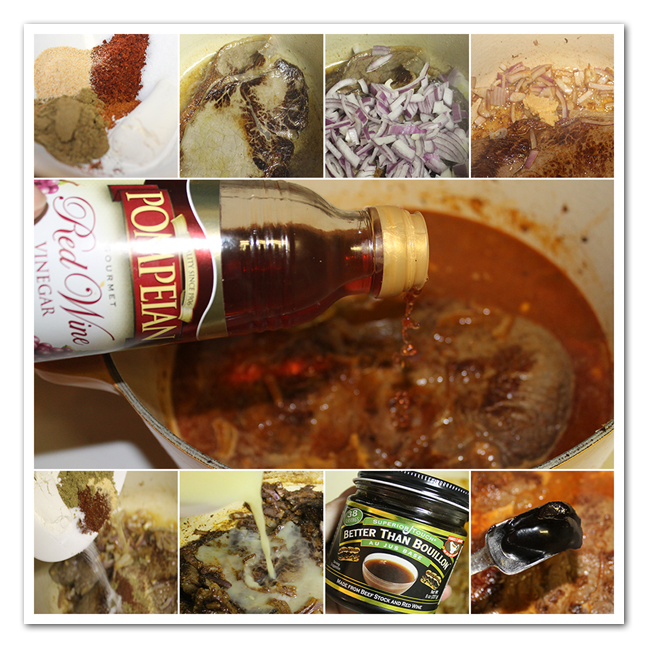 Add beef and brown on all sides. Add onions and jalapenos and saute for 4 to 5 minutes. Add garlic and saute for 1 minute more. Mix in flour mixture, stirring frequently, for 2 to 3 minutes. De-glaze with chicken broth, add the beef base. Then add vinegar. Stir well to combine. Bring to a boil. Lower heat to medium-low and simmer for about 2 hours, adding additional broth, if necessary, to keep meat simmering in liquid. When meat is fork tender, remove to a sheet pan and shred with 2 forks. 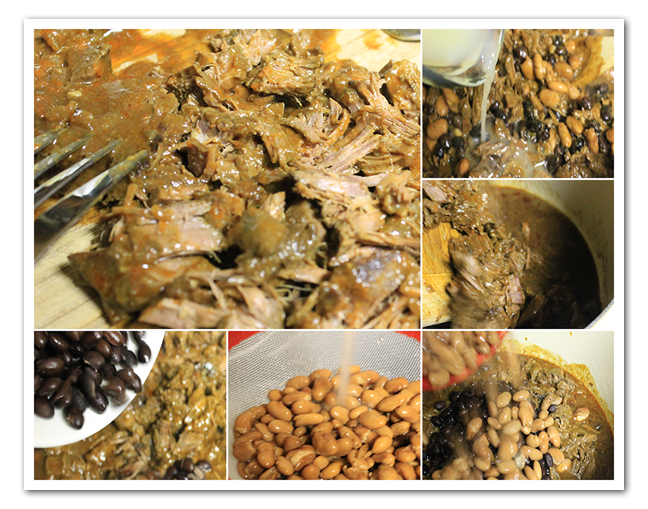 Add shredded beef back into pot, along with pinto and black beans, lime juice. Cook until mixture is heated through. Remove from heat and allow to cool. 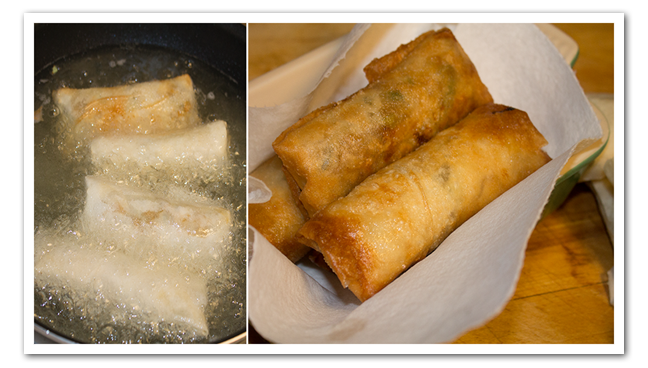 Preheat deep fryer to 350 degrees F. While oil is heating, prepare chimichanga's. Fill bottom half of a tortilla with ¾ cup of the beef and bean mixture and 2 tablespoons pepper jack cheese (when filling tortillas, use a slotted spoon to scoop out beef. Lift the edge of the tortilla and roll it over the filling to secure it. 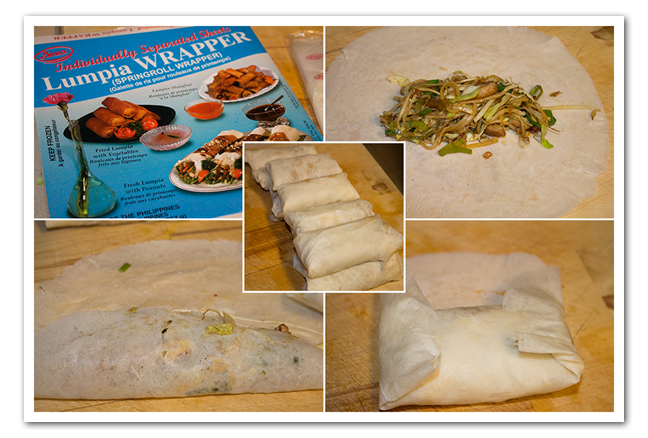 Fold in both sides and continue rolling until you reach the opposite end. Secure with a 6-inch skewer weaved through the seam side of burrito. Repeat with remaining tortillas. Slowly lower chimichanga's into hot oil and cook 2 minutes until golden brown. 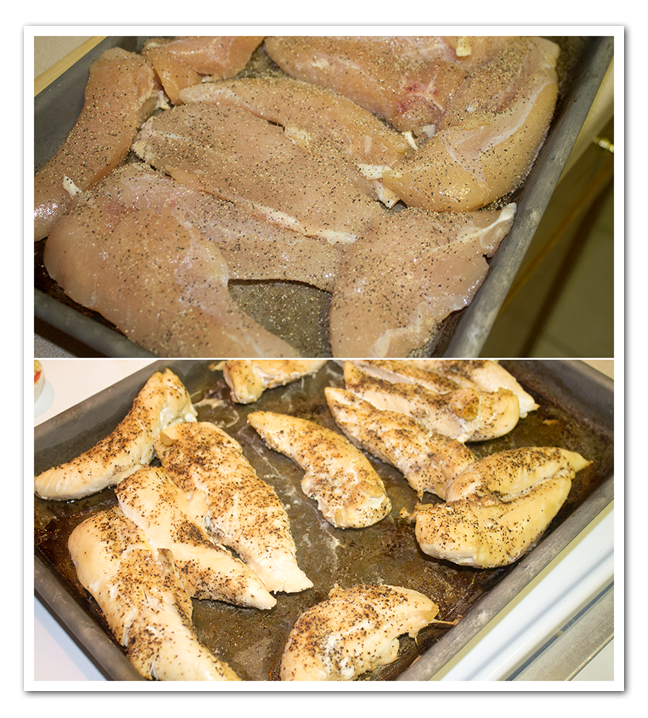 Remove from oil, drain on paper towels and keep warm in oven until all are cooked. Note: If tortillas tear while folding, make them more pliable by wrapping tortillas in damp paper towels, then fully cover with foil. Place in 250 F oven to warm them up.